There is perhaps no better way to compliment the brute force of your Mercedes-Benz than with the elegance of our carbon fibre specialty pieces. Compromise is not in our vocabulary. Power, poise and finesse are attributes that best describe a BMW M vehicle. Yet when an M vehicle is equipped with Mode Carbon products, we are inclined to use the word perfection. When technology and engineering are the core principles surrounding a product, the outcome is bound to reflect it. 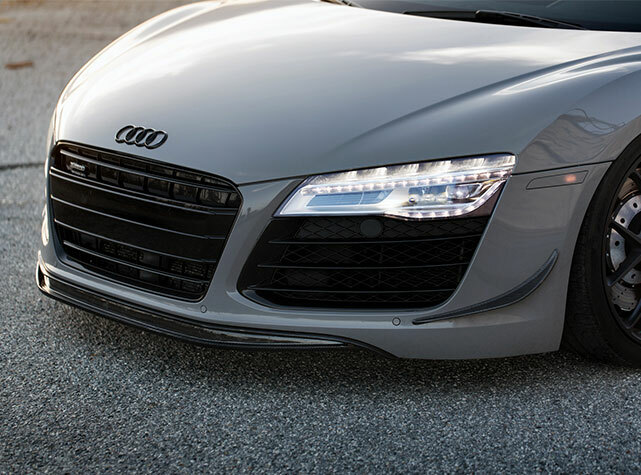 The aurora of our carbon fibre gleaming plain sight is the ultimate embodiment of Audi’s cutting-edge modern persona. Combining the highest expression of Lamborghini’s power with the exclusive refinement of our carbon fiber craft, this composite yields an unprecedented level of workmanship. At Mode Carbon, all raw materials used in our manufacturing are hand-picked from to ensure that our carbon fiber products exceed even the most strict industry standard of quality. The result of our commitment to quality is high-grade carbon fiber that reduces weight, increases performance and improves aerodynamics.